a. De grant travail et de petit esploit [2:22] canción a la Virgen | TEOBALDO I de Navarra, 13th c.
Nelly van Ree Bernard was born in the Netherlands in 1923 and grew up in Spain, where she gained her piano diploma at Academia Marshall in 1945 [Barcelona]. She finished her studies in Interior Design in 1949 [Amsterdam]. She studied harpsichord with Jaap Spigt [Amsterdam] from 1960 onwards and spent a year [1968/69] in India studying Hindustani music with Dr Premlata Sharma [Varanasi]. After her return from India she gradually changed from harpsichord to clavichord and she began to concentrate on 16th century Spanish music, greatly helped by Dr Santiago Kastner [Lisbon]. 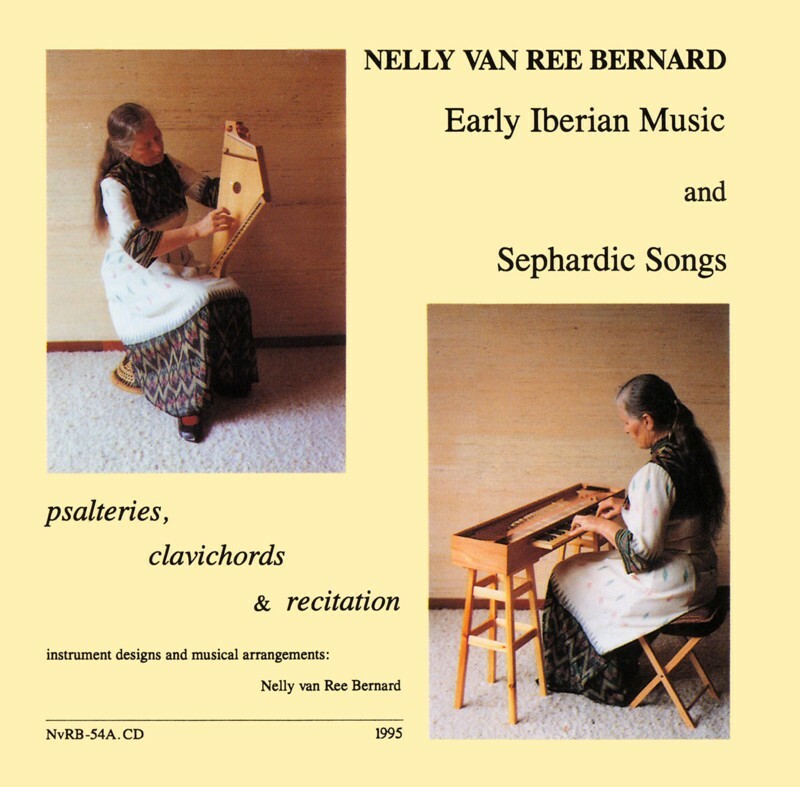 She formed the vocal-instrumental ensemble MUSICA IBERICA and began to re-design 'lost' early instruments [various types of psaltery and very early clavichords], which were built after her working drawings by different instrument-makers in Germany and Holland. She reconstructed the playing methods of the 'reborn' instruments, recording the different aspects in publications and on LPs, cassettes and CDs. She has been giving lectures and courses on Early Iberian and Hindustani music at different Universities and Conservatories in the Netherlands and abroad. Since 1966 she has been organizing concerts, lectures, courses, exhibitions and demonstrations of instruments, at her music centre 'HET DUINTJE' [Bennebroek, Holland], where about 70 European and non-European instruments, including her own reconstructions [three clavichords and eight psalteries], were permanently on show for visitors until 1993. From 1986 to 1993 she has been a board member of HET NEDERLANDS CLAVICHORD GENOOTSCHAP [The Dutch Clavichord Society, founded in 1986]. Besides in Holland, Nelly van Ree Bernard has presented musical activities in Austria, Belgium, Canada, Germany, India, Italy, Norway, Poland, Portugal, Spain, Switzerland and the United States of America. The songs recorded on this compact disc belong to the Sephardic repertoire of the descendants of Jews expelled from Spain by the Inquisition in 1492. They settled mostly as communities in countries around the Mediterranean, such as Morocco, Turkey and Greece, or emigrated to Portugal from where they had to flee again some years later, in 1497. Many of them then went into exile in Amsterdam. The Sefardim maintained Old Castilian as their language for a very long time, the pronunciation of which is slightly different from present-day Spanish. The melodies and the texts were influenced by the music and languages of the various host-countries, so that certain songs are now preserved in different versions. • Anglès, H., La Música de las Cantigas de Santa María del Rey Alfonso el Sabio, II, Transcripción Musical, Diputación Provincial de Barcelona, Biblioteca Central, Barcelona, 1943 [Nos 2b, 3b, 4a]. • Anglès, H., Juan Vasquez, Recopilación de Sonetos y Villancicos a quatro y a cinco, Sevilla, 1560, MME IV, CSIC, Barcelona, 1946 [No 11b]. • Anglès, H., La Música en la Corte de los Reyes Católicos, III, Polifonía Profana, Cancionero Musical de Palacio, s. XV-XVI, MME X, vol. 2, CSIC, Barcelona, 1951 [No 11a]. • Anglès, H., La Música de las Cantigas de Santa María del Rey Alfonso el Sabio, III, 2a parte, Diputación Provincial de Barcelona, Biblioteca Central, Barcelona, 1958 [sección I: Nos 10a, b; sección II: No 3a; sección IV: Nos 5a, b]. • Anglès, H., La Música en la Corte de Carlos V, con la transcripción del Libro de Cifra Nueva para Tecla, Harpa y Vihuela de Luys Venegas de Henestrosa, Alcalá de Henares, 1557, MME II, vol. II: Música, CSIC, Barcelona, 1965 [No 11c]. • Anglès, H., Historia de la Música Medieval de Navarra [obra póstuma], Excma Diputación Foral de Navarra, Ed. Aranzadi, Pamplona, 1970 [No 2a]. • Levy, I., Chants Judéo-Espagnols, World Sephardic Federation, 67/68, Hatton Garden, London Ed, 1959 [No 8a]. • Milner, Ch. & P. Storm, Sefardische Liederen en Balladen - Romanzas, Ed. Albersen & Co by, Den Haag, 1974 [Nos 4b, c, 8b, c, d, 9a, b, c]. • Seguí, S., Cancionero Musical de la Provincia de Alicante, Excma Diputación Provincial de Alicante, 1973 [Nos 6, 7]. • THE PSALTERY - An annotated audio-visual review of different types of psaltery, NvRB-47, Frits Knuf Publishers, Buren - The Netherlands, 1989. With music cassette. ISBN 90-6027-610-8 [cloth], ISBN 90-6027-609-4 [wrappers]. • SEVEN STEPS IN CLAVICHORD DEVELOPMENT between 1400 & 1800 - An annotated audio-visual review, Frits Knuf Publishers, Buren - The Netherlands, 1987. With music cassette. ISBN 90-6027-520-9. • THE KEYED MONOCHORD - rediscovery of a forgotten instrument - a hypothetical reconstruction - with musical examples, NvRB-62, ISBN 90-73018-45-5. With compact disc: REDISCOVERY OF THE KEYED MONOCHORD, Medieval Melodies and Sephardic Songs, NvRB-62 CD, ES 47.094 CD. Edition Muziekcentrum 'Het Duintje', Binnenweg 6, F-209, 2121 GX Bennebroek - The Netherlands. This recording is a compilation of a series of musical examples played on psalteries and clavichords which I reconstructed between 1975 and 1986. For the redisigns I made use of data from early manuscripts, including miniatures, drawings and texts. The instrument types which we might assume to have been in use on the Iberian Peninsula are the canon entero , the medio canon , the citara , the ala entera , the salterio 'Minguet'  and the monachordio 'Bermudo' . The tetrachord , the semichromatic octochord  and the tangent tetrachord  represent types in use in different parts of Europe. 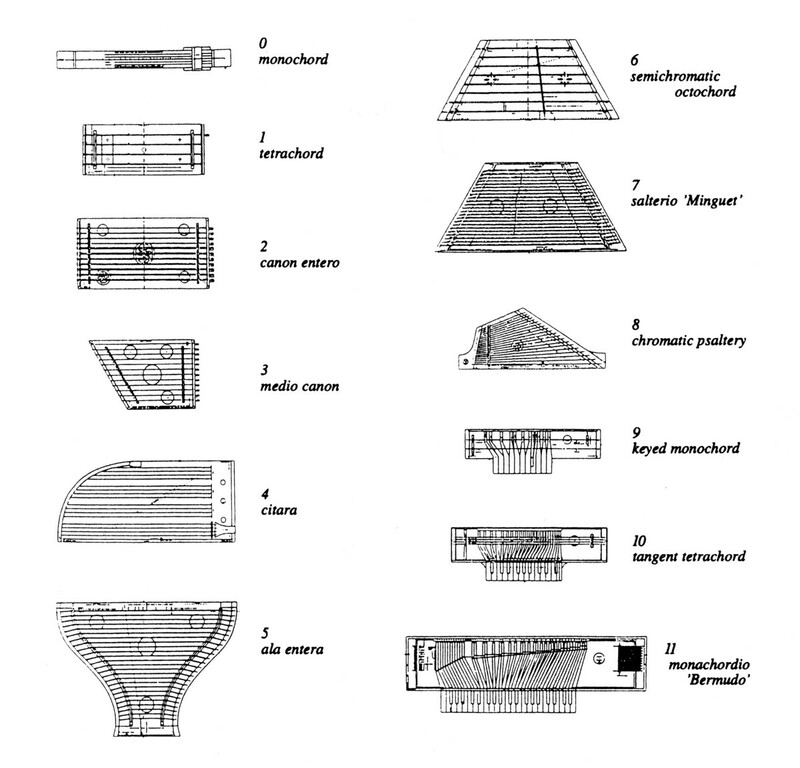 The keyed monochord  is meant to represent the most primitive form of the clavichord. The chromatic psaltery  is a fancy instrument designed for interpretation of folkloric music of different cultures.